Photo: Powder skiing on the East Face of Diamond Head in mid-winter. 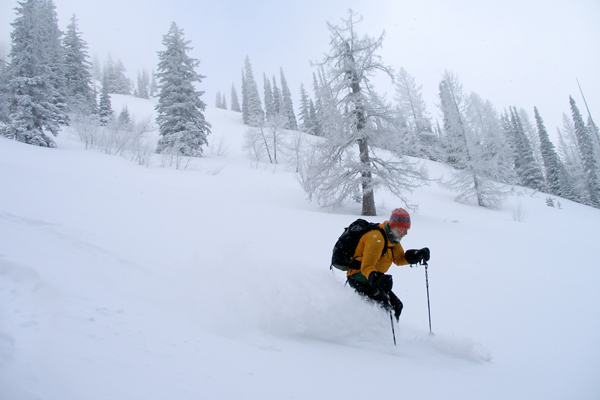 Attractions: Beautiful telemark and randonnee skiing near the Wenatchee Valley corridor. Various descent possibilities give you a choice of slopes with different exposures, tree coverage, snow conditions, and avalanche hazard. Throughout most of the winter and early spring, this is a good place to find East-side powder conditions. The area (other than the very top, which can be accessed from a different direction) is also a non-motorized zone. 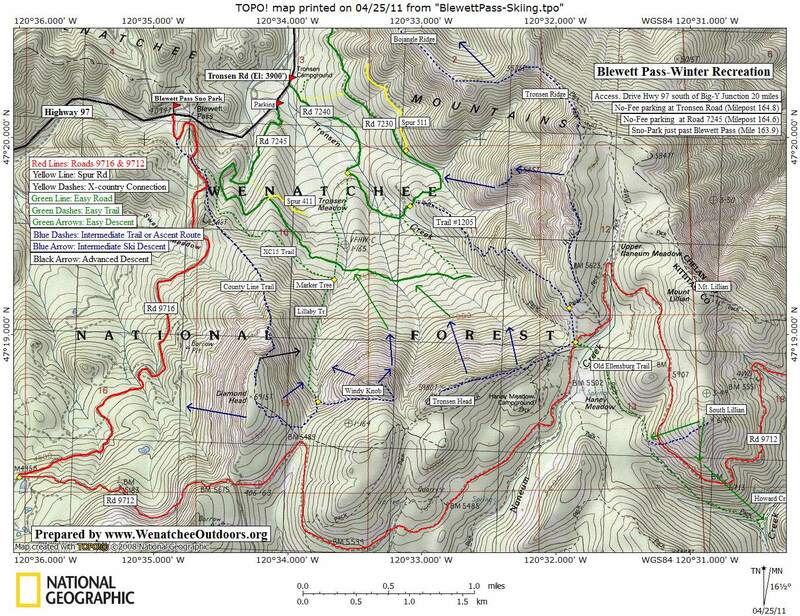 Maps: USGS 7.5-minute Series—Blewett Pass. View our topo map below. Note: use ‘Print Preview’ before printing to properly scale this map to a full sheet of paper. Activity: Backcountry skiing and snowshoeing. Skill Level: 2 — there are intermediate and expert options off the peak. Elevation Gain: Start 3, 900 feet. Highpoint: 5,930. From the Highway 2 – Highway 97 junctions (Big-Y Junction), drive south on Highway 97 toward Blewett Pass for almost 20 miles. At milepost 164.8, park on the east side of the highway at the Tronsen Road (Road 7240). This is a trailhead for non-motorized use only and does not require a permit. Elevation 3,900 feet. Note: The USGS topo map does not show most of the roads, trails, and ski trails established in this area. Our topo map includes many (but not all) of the roads and trails. The first few times you visit here, you’ll need to pay close attention to the map. If no one who knows the area has laid a fresh approach track, you’re likely to need both a map and compass to keep yourself on-route. Head 0.8 miles up Road 7240 from the highway. At a prominent 3-way intersection where you’ll see blue diamonds on a big ponderosa pine, do not turn left. Go straight. Go about another 0.25 mile and at the next Y, take the smaller right spur. This spur drops just a bit at the very start, then contours (it curves as it contours while the road you turned off of goes straight). Go a few hundred yards and look for a trail marked by a blue-arrow sign on the left side of the road about 75 yards before you enter a meadow dotted with a few big ponderosa pines. If you reach this pine meadow (Tronsen Meadow) you’ve gone too far. Turn left at the blue-arrow sign and start climbing more than contouring. The trail goes up and heads slightly right (as you climb). After about 200 yards, the trail makes a jog to the right where it contours for about 75 yards and then hooks left and climbs up the fall line again. After another 150 yards, this happens again—you contour right a bit then hook left and climb the fall line again. About 200 yards above the second contour, intersect a large road — there is no signage, but this is Road 7245. Go straight across the trail and climb straight up the hill on a path. In a few hundred yards, you will now come to a marker tree with several small, non-Forest Service signs. If you were to turn right, you would go to Sauk Pass (1.8 miles) on XC15 Trail. Instead, turn left on what some locals call the Lillaby Trail. This heads uphill to Haney Meadow which is 2.7 miles away. Follow the Lillaby Trail on a long, ascending contour for about 0.75 miles. Along this contour which follows on the west side of a small creek drainage (the creek may or may not have water), you’ll pass under few big open slopes which, if avalanche conditions permit, are possible descents. About three quarters of a mile from the marker tree (at about 5200 feet) the trail takes a sharp hook to your left (east). You can hook east here and climb up toward Windy Knob or Diamond Head East (neither of these are official names), or you can climb south and then west up to Diamond Head proper. The top of Diamond Head is large and treed (good wind protection). Snowshoers are likely to want to pick a descent route fairly close to their uptrack. Skiers looking for steep turns can work to the northern end of the plateau and then head east. The top of this run is steep and avalanches are a very real concern (the author of this report has kicked off a number of slides here over the years). 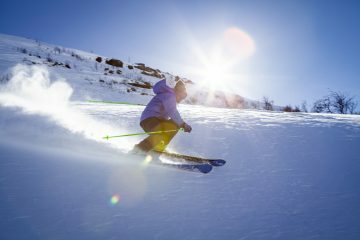 Evaluate the snow well before you venture onto these slopes. 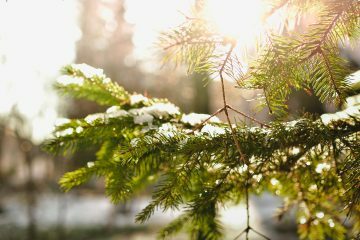 If avalanche hazard is high, check the treed southeastern slopes. In spring (typically April), the west slopes of Diamond Head can offer some very nice corn-snow skiing as well. The west slopes get hammered by lots of wind and tend to be rocky so look for little terrain traps (gullies) that collect more snow. Diamond Head East (aka Windy Knob) has some terrific skiing as well on its northern and northwestern slopes. The initial drop off this summit is steep and hazardous in unstable snow conditions, but the lower apron is quite moderate in pitch. After skiing the lower slopes, a very gentle contour to the west will get you back to your approach route while a steeper drop through the forests will take you down to Road 7245. More about this route in our Windy Knob guidebook entry. Cons/Hazards. There are many steep slopes in the area which can (and will) slide in unstable snow conditions. Ski with a partner; know how to evaluate the hazard (e.g., dig pits), choose another option if the snow analysis of the slope you’re intending to ski reveals some hazard, use proper skiing protocol (ski from safe zone to safe zone exposing only one person at a time), and carry (and know how to use) all the proper safety equipment (transceiver, shovel, probe, first-aid supplies). Fees/Permits: As of 2011 no permits or Sno-Parks were needed for the parking. Trip Reporter: Andy Dappen, March 2006. Updated April 2011.